Double London 2012 Olympic Games gold medallist Mo Farah may not have run over 25 laps of the track since his triumph on home soil last summer, but there is no doubting that he remains the favourite to go one better than he did in Daegu two years ago and take the gold medal in the longest event on the track. Farah has shown over a variety of distances this summer that he is in great shape and his European 1500m record of 3:28.81 will only serve as a warning to the rest of the 37 men entered in Saturday’s race. What should be obvious to everyone is that, although he was beaten by a 52.8 last lap from the Ethiopian surprise Ibrahim Jeilan, they cannot leave matters until the last one or two laps before stepping up the pace as Farah has also found another gear in the last two years. Conversely, Jeilan has hardly looked like a World champion in the last 18 months. Injuries meant that he missed almost all of last year and he didn’t compete in London. This year he has not finished higher than third in any race over any distance, and his times have been modest, but his three compatriots lead the 2013 list for the distance. In a top quality race in the Swedish town of Sollentuna on 27 June to decide who would accompany Jeilan, 2012 Olympic Games 5000m silver medallist Dejen Gebremeskel made his debut over the distance and ran 26:51.06, which will certainly act as a nudge to Farah in the unlikely event he has any complacency. Behind Gebremeskel was Abera Kuma and the experienced former IAAF World Cross Country Championships winner Imane Merga, fifth and third in Daegu two years ago. Both men were also inside 27 minutes, the only men to so far get under that benchmark this summer. It’s indicative of the quality of the quartet that World record-holder and former World champion Kenenisa Bekele has only been named as a reserve, despite being the fourth fastest man in the world this year. 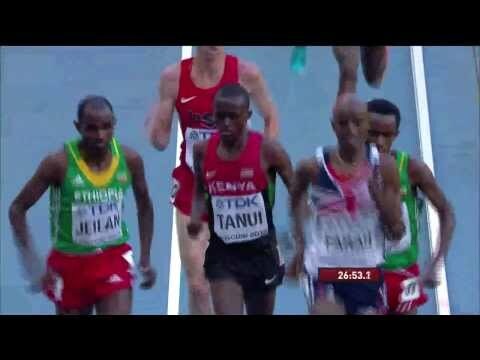 Kenya’s trio is led by Bedan Karoki, who finished fifth in London last summer. Unlike most of the other potential medal contenders, Karoki has already raced 10,000m three times this summer and could only finish fourth in the Eugene race won by Bekele. Also in the Kenyan team is the 2011 World Cross Country Championships silver medallist Paul Tanui who, like Karoki, is based for much of the year in Japan and secured his place on the plane after finishing second to his friend at the Kenyan trials. Farah’s US training partner and friend Galen Rupp won the Olympic silver medal 12 months ago, the first US Olympic medal in this event for 48 years, and will be looking for his nation’s first IAAF World Championships medal in this event. It’s difficult seeing anyone other than the seven men, not including Jeilan, mentioned above winning a medal but if anyone is going to cause a surprise it could be Eritrea’s Teklemariam Medhin, who won the bronze medal at the 2013 World Cross Country Championships. Uganda’s three-time World Cross Country Championships medallist Moses Kipsiro, who went close to medals over 5000m when finishing fourth at the 2008 Olympic Games and 2009 World Championships, is also in the field but not in the same form as a few years ago and his country’s best man might be Timothy Toroitich.